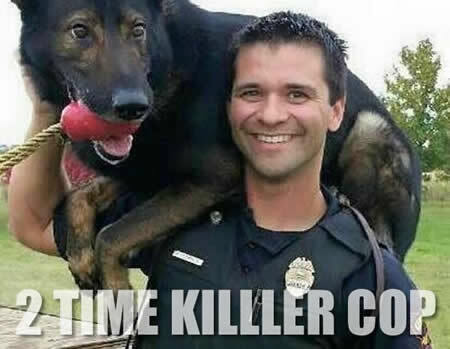 On his first day back from mandatory leave for shooting and wounding a knife-wielding man this month, Wisconsin police officer Pablo Torres shot and killed an suspect after confronting him following a chase. Kenosha police officer Pablo Torres returned from leave Saturday, 10 days after shooting a man who advanced on police armed with knives. Torres was placed on administrative leave by department policy in police-involved shootings. Saturday morning, police chased a car driven by 26-year-old Aaron Siler, who was wanted on a felony probation warrant. Torres confronted Siler, Siler “armed himself with a weapon” and Torres fatally shot him, Hetlet said. This was the story claimed by Officer Pablo Torres when faced with murdering the victim. In the earlier officer-involved shooting, Torres, an 18-year veteran of the police force, was among three officers and a recruit who went to a home after a woman called to say her husband had gone into the garage to kill himself. Police say the man was armed with two knives and was seated in a running vehicle. When the man refused to drop the knives, two officers shot him with Tasers. When the man began advancing on police, Torres shot him once in the stomach.